I Love Being A Turtle!!!! Again!!! You read to be a turtle again?? Well your time is near. There is a new TMNT series in the works over at Nickelodeon. They bought the rights to the turtles back in 2009 from Mirage fro about $60 million dollars. The show will debut in 2012 on Nickelodeon. The Wall Street Journal quotes Ciro Nieli (exec. 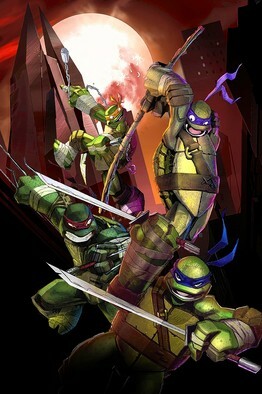 producer), “the newly revamped turtles will have “more individual attributes” than they did before. They look for the most part the same, but that is just one picture. I love the TMNT franchise. It has been a little while since I have seen them on screen. Last time was that CGI film which was actually really good. I even bought the XBOX game. Also in the works, is another live-action TMNT film. No word on when that will happen, but Iron Man writers: Art Marcum & Matt Holloway have signed on to pen the script. Teenage Mutant Ninja Turtles Mash-Up With WWE Is A Genius Idea!!! This entry was posted on Wednesday, March 9th, 2011 at 5:09 pm	and is filed under Film, News. You can follow any responses to this entry through the RSS 2.0 feed. You can skip to the end and leave a response. Pinging is currently not allowed.